Well only if you want healthy plants, otherwise you don’t need to worry about it. Plants can suffer from nutrient deficiencies, even with a fresh and perfectly balanced nutrient solution if the pH is out of range. Kind of like how you can freezes to death in full sunlight at the north pole, or drink all the salty seawater you want and still suffer or even die of dehydration . Even when one variable is sufficient, another variable can cause a big problem. Think of it like being really hungry, and there’s a nice big juicy hamburger just out of reach. Improper pH ranges can also result in precipitates (calcium sulfate), a white cloudy or powdery looking substance that can float or even settle at the bottom of your reservoir. When the pH of the nutrient solution rises above 7.0, a chemical reaction can occur causing the calcium to bond with sulfate and other trace elements like iron, copper, zinc and manganese causing them to become unavailable to the roots. It can even cause problems with emitters and/or misters clogging, and buildup in the growing medium, and in extreme cases can cause plumbing blockages or restrictions (like clogged arteries). The exact pH that precipitation of the nutrients begins, depends on the exact concentrations of calcium and sulfate in the nutrient solution. But it typically can begin at 6.5, unless the particular nutrient solution is low in concentrations of calcium and/or sulfate. Generally speaking, higher nutrient concentrations are more likely to result in precipitates, than lower concentrations. 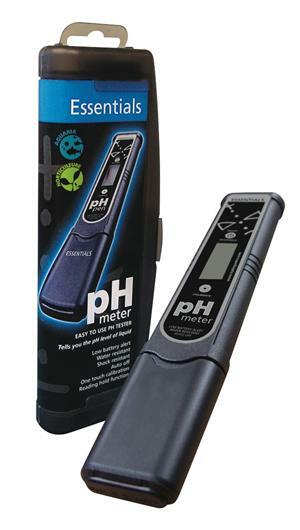 For best results it’s a good idea to have a regular routine for checking your pH levels and adjusting when necessary. Check the pH of the water before initially adding the nutrients to help prevent precipitates while mixing them up. But unless the pH is well above 7.0, don’t bother trying to adjusting it before adding the nutrients, or you may experience wild pH swings while trying to reach the target pH. Most nutrients have pH buffers added, and will begin lowering the pH as soon a it’s added if it’s to high. If the nutrients that you are using have more than one part, add them separately, and thoroughly mix each of them before adding the next part. Same goes for any additives that you may be using. Then check the pH of the freshly mixed nutrient solution once it’s all mixed and ready to use. You should also check the pH of any system other than a non-recovery (run to waste) system daily, because the nutrients and water the plants take up causes the pH to change, particularly when the water to plant ratio is low. In other words, the larger the amount of nutrient solution, the less fluctuation that is likely to occur, and larger plants use more water and nutrients than smaller plants. You should also check the pH anytime you add any fresh water to top off the reservoir (and/or nutrients or additives). The pH of the water supply can change daily, so even if you have checked it in the past, it can be different today. To check pH you can use either a liquid pH indicator (drops), paper test strips, or an electronic pH meter. The electronic testing meters are the most expensive option, and require calibration (including calibration fluid), as well as regular maintenance and care or they wont give accurate results. So you will need to fallow the manufactures instructions carefully, but even with proper care and maintenance, they may not give reliable readings. I prefer to use the liquid pH drops because they are inexpensive, as well as accrete, and cost less than the calibration liquid for the electronic meters. But mostly because they don’t require any calibration or maintenance in order to be accurate, and/or reliable. I have never used the paper test strips, but they don’t require any calibration or maintenance either, and are quite accurate as well. 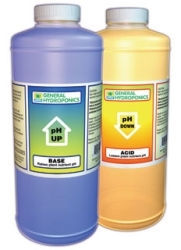 You will want to choose a target pH, for your nutrient solutions. It’s completely unnecessary to hold pH at a single point value like 5.8, in fact it’s better not to. Plants have evolved over millions of years, and can easily tolerate pH ranges, and the less pH adjusters that you add to your nutrient solutions the better. Choosing a target pH right in the middle of the range you intend, allows for pH fluctuations in either direction. A good example would be if the pH range for the plants you are growing is 5.5 to 6.5, set the target pH for 6.0, that gives room for fluctuation in either direction. pH adjusters come in both dry and liquid forms. But which ever you type you use, make sure to add small amounts at a time. It’s impossible for manufactures to give exact directions on how much to add because of all the variables like size of reservoir, type of nutrients, weather the nutrients have pH buffers added, and the amount of pH change needed. When adding pH adjusters, it’s best to dilute them in water before adding it directly to the reservoir, that helps prevent precipitates from extreme pH changes before it can be mixed in. If accidentally raising the pH above 6.5, lower the pH again as quickly as possible.